Good diagnosis, Healthy Sunlight Uncle. Photo courtesy of Michael Barton. 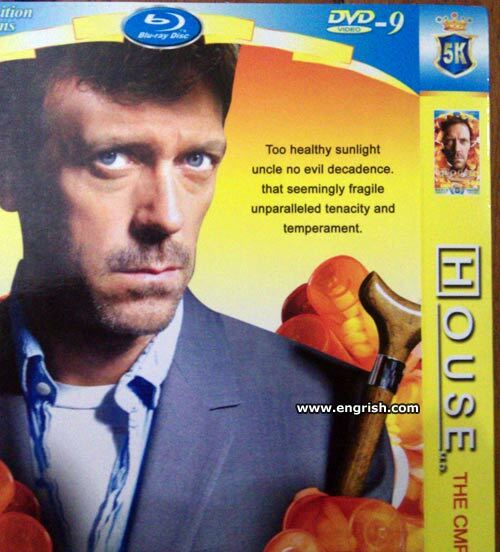 House blu-ray sold in East Africa. Too healthy sunlight only tans and provides vitamin D, but does not burn the skin. Hear no evil, see no evil, speak no evil, uncle no evil. Uncle no evil, but he decadence. Sunlight uncle’s name is Ray. His tenacity and temperament is perpendicular.to fragile. Too healthy sunlight. Needs more UV-C. Apparently, one little-known side-effect of Vicodin is Engrish! Must be an aborigine….H’s carrying a message stick. Dr. “You have dyspepsia, diplopia, diverticulitis, dizziness, double vision, dracunculiasis, dystonia, and DJD. I wonder what “THE CMP” or “THE CMF” is supposed to be. Too healthy sunlight won’t cause lupus. … or else it gets the sunburn again. Here in Oz., CMF = Citizens Maniacal Farces. Avuncular sunlight too scary, go in House now! Uncle no evil cuz Aunt is evil. Not sure if Blu-Ray or DVD…? @McBee: it is everything you want it to be. It’s even in 5K resolution! If he’s not dead, how come those red worms are crawling all over him? Well, you can never be too healthy, unless you’re a sunlight uncle.